Summary for the Busy Executive: O Gucci! O Olivetti! O Italia! Because I had heard none of the pieces before – indeed, only two of the composers had written music I knew, and the rest were all brand-new names – I approached this CD with great expectations. If Lazarus Long was right and ninety percent of everything is rubbish, I'd come out ahead with even one enjoyable new work. Collections of fugitive pieces – from whatever period – are, after all, a crap shoot. The collection here draws together pieces from the "hard" wing of post-World War II composers (with a ringer). On the other hand, it's all for winds, and composers usually let up a little for these forces. Berio is probably the best-known name on the disc, and I enjoyed his Ricorrenze ("Recurrence") more than the other pieces. It's a curious thing. All sorts of influences float in and out, most notably and strangely Stravinsky's Le Sacre, with the ideas, frightening in the large orchestra, showing up with real charm in the woodwind quintet. The music bubbles and spurts. It's like seeds sprouting in Spring. For all its attraction, it poses great challenges for the wind players from its opening bars – killer unisons broken up among the various instruments to test pitch-matching to its limit. One also finds rhythmic asymmetries, something that sounds like senza misura counterpoint (but probably isn't) before trip-hammer attacks from the instruments all together. In its way, its character is mainly lyrical, although I admit not in Puccini's manner. Sciarrino's Quintettino #2 seems little more than a compendium of special effects – blowing through the instruments without producing tone, rapping on the instruments, and so on. Its saving grace is its brevity, but unfortunately it's not brief enough. Francesconi's Attesa is the kind of small-ensemble piece that most conservatory composition students used to write in the Sixties and Seventies. I can't find anything particularly original or noteworthy about it. Furthermore, it goes on for far longer than the Sciarrino. When people talk about composers driving audiences away from contemporary music, this is the kind of piece they probably have in mind. Its complexity lies mostly on the surface and even then runs no deeper than any other veneer. I have no idea whether it's dodecaphonically serial or not. It really doesn't matter. Ludovico Einaudi's Ai margini dell' aria (which I fancifully translate as "toward the edges of song") manages to say a lot with a little. All the "themes" move mainly by sequential half-steps. The piece lasts about ten minutes, but there's enough variety and the scoring falls pleasantly on the ear. To some extent, it's an exercise of ingenuity, as he rings all kinds of changes on rising and falling half-steps, but the piece is also filled with lovely moments. Gentilucci's Cile 1973 elegizes the overthrow and murder of Allende – an outrage apparently supported and abetted by my country's government. Like many artistic attempts to deal with Big Themes, this one falls way short. Despite the composer's good intentions, the music simply fails to hold interest – essentially, yet another compendium of Sixties' and Seventies' avant-garde tricks o' the trade with little or no real poetry. It's like being trapped in an elevator with an advocate suffering from terminal earnestness hour upon hour, and Gentilucci's work doesn't last as long as Einaudi's. The mountains have labored to birth a tiny mouse. The Arnold Quintet throws us the bone of Ghedini's Quintet #1 – a genuine charmer that could have been written anytime from 1850 on, although Ghedini, Berio's teacher, was born in 1892. This is a very early work, and Ghedini's mature output is far more modernist, sort of in the way of Malipiero. I have no idea what he would have made of his pupil, but he's a really good workman with a delicate sense of lyricism – qualities that carry over to Berio's Ricorrenze, at any rate. His treatment of the winds owes a lot to Rimsky-Korsakov, particularly if you know the Rimsky Quintet for piano and winds. I'm not really sure – other than perhaps to advocate good music of whatever style – why this work appears on the program. It won't really appease either the die-hard mossbacks or the fanatic up-to-the-minutes. However, it's a lovely pastel that deserves better than getting lost in the shuffle. 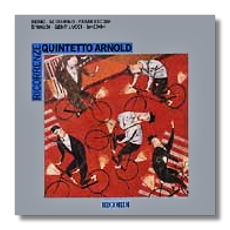 The Arnold Quintet plays all this music with flair, wit, and understanding.